Help Me Mommy has been northwest Indiana's Rocky Horror Shadowcast since July 26th, 2008. Based out of the historic Art Theater in the city of Hobart, Help Me Mommy has been steadily resupplying "The Region" (of Northwest Indiana) with a healthy dose of counter culture and absolute pleasure! Like all things related to Rocky, the cast began with a trip to the movies. Mat Kniola (of the retired northwest Indiana cast Pink Invaders) was watching a movie with his family in the historic Art Theater. Afterwards, he mentioned to the owners how great hosting a Rocky Horror cast would be. One thing led to another, and in a very short time, the cast was on its feet, eagerly awaiting opening night. 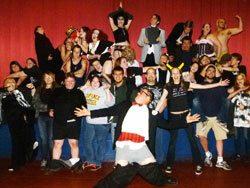 The cast started out consisting of audience members and performers from the retired Pink Invaders cast. (The Pink Invaders cast lost their theater and disbanded in late 2006.) 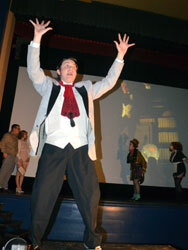 Ed Lipinski, Mat Kniola and John Davey led the charge to kickstart a new generation of Region Rocky Horror fans. Help Me Mommy started fresh, with a very different audience and a fresh take on our beloved classic show. Early rehearsals were held in Zero and Kristen Esgate's basement, while multiple thrift store journeys, all nighters and sewing fests, helped to assemble costumes, props and survival kits. Help Me Mommy has been running full steam as a weekly live show for four years and counting. In the few years together as a cast, Help Me Mommy's cast members have performed in many different locations and venues: everything (and everywhere) from Notre Dame to New Jersey. The cast runs an amazing collection of pre-show film clips, ranging from classics such as "I Do the Rock" to the Megaforce trailer to the geography song from "Animaniacs," or a "Let's All Go to the Lobby" trailer where animated food items sporting body piercings threaten the audience ("I will cut you!") for any misbehavior. 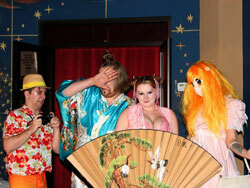 Our special theme nights are hard to ignore, from specialty events like our unique, scene-famous Kung-Fu Night, where we wear Asian costumes and turn off the sound so we can "badly dub" ourselves with live dialogue; to local favorites like Dead Celebrity Night. It's not uncommon to see the audience participating in pre-show dance parties mixed by our own local hero, DJ Twitch (John Davey). Help Me Mommy lives by one simple phrase that continues to guide us into great adventures: "Don't Dream It, Be It!"